This is a book review post. I was provided a copy of the book in exchange for my honest review. This post contains affiliate links. By clicking a link and buying something, I might earn a small commission at no extra cost to you. As an Amazon Associate I earn from qualifying purchases. For additional details click here. 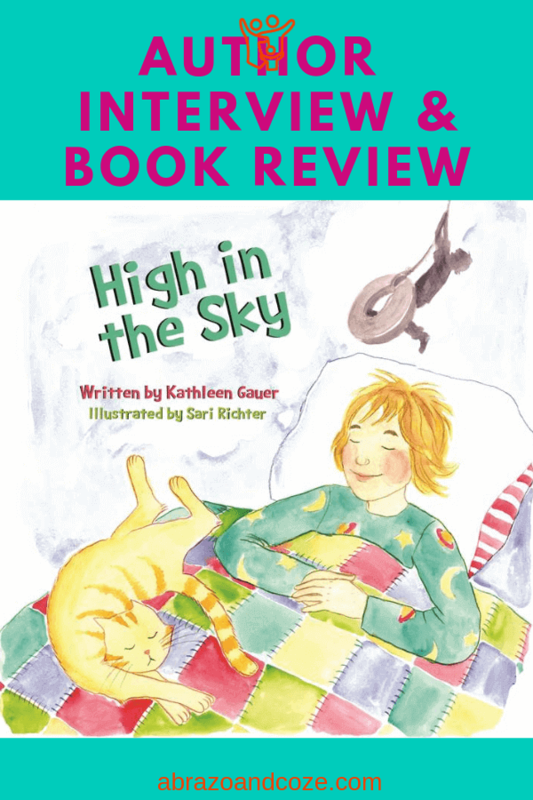 If you have young children, they will love High in the Sky by Kathleen Gauer. It’s whimsical, flowing language takes children along a tale of adventurous pretend play. Not surprisingly, the main character is a child. A child who is full of emotion. When they feel overwhelmed with life and like they’re about to explode, they go out to play and burn off all that energy. While doing so, they dream up all sorts of amazing adventures as they swing to and fro upon a tire swing hanging in a tree. Your children will identify with this character’s initial emotional overload, especially after a busy day at school, or after a trying time dealing with siblings or friends. Undoubtedly, their imaginations will connect with the character’s exciting pretend adventures, too. As a parent, of course, you’ll relish the lesson that emotions don’t have to control us, but in fact, the opposite is true. After enjoying this rhythmic story with your kids, you’ll have a teachable moment to reinforce the idea that when people are feeling stressed, they can work through those feelings of overload through play, through time alone with our thoughts, and by using our imaginations to take us somewhere that our stress doesn’t exist. And the text isn’t the only wonderful aspect of this energetic tale. The bright watercolour illustrations by Sari Richter are well suited to the daydreaming of a child. They add to the story and turn the tire swing into all the wild adventures. To finish it all off, there are some follow up activities at the end of the story for you to enjoy doing with your children. For those of us who don’t know who you are, can you introduce yourself? 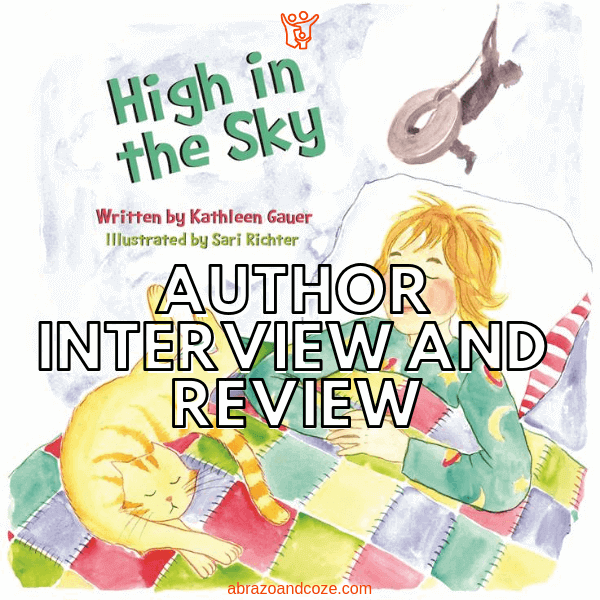 My name is Kathleen Gauer and I’m a published Children’s Book Author (High in the Sky, December 2015; For No Reason, June 2017). I’m also a wife, mom of two adult children and have two grandsons, 11 and 14. I live in Toronto and recently retired as an Educational Assistant in Special Education with the Toronto District School Board. 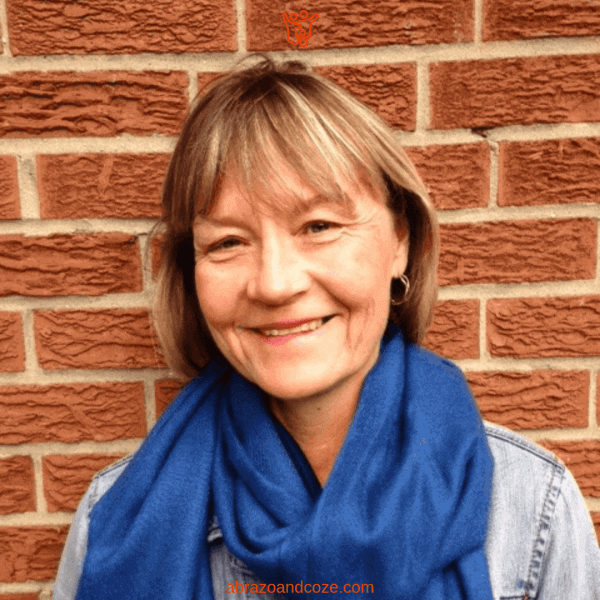 When not reading, writing or spending time with my family, I enjoy yoga, knitting, travelling the world and singing with The Harmony Singers, a local choir that performs in the Toronto area. I also visit schools, libraries and volunteer with the IBBY Reading and Refugee Program in Toronto. What sparked the idea for High in the Sky? My inspiration for writing High in the Sky popped into my head one summer day while relaxing in my backyard with a book. I could hear the neighbour children’s excited squeals coming from the other side of the fence as they pumped higher and higher on their swings. I pictured my grandchildren and how they love to swing and dream on a swing. It also reminded me of my childhood, flying high and carefree on a tire swing. My mother used to read the poem The Swing from A Child’s Garden of Verses by Robert Louis Stevenson and I was able to read High in the Sky to her before she passed away in December 2015. How did you come up with the main character in High in the Sky? I chose a healthy, charming and energetic child that could be a boy or a girl. Like most children, my character sometimes feels like the world is too small. By hopping onto a tire swing, this feeling of boredom and restlessness disappears. Suddenly the child can travel anywhere or become anything, simply by using the power of imagination. Did you always want to be a children’s book author? This was always my dream – to publish a children’s book and have it be available in libraries and bookstores. I’ve always loved to write, particularly in rhyme. I’m certain everyone has at least one book inside them just waiting for the opportunity to have its tale written. I just decided to get mine published. And in High in the Sky, I wanted to share the message that your imagination can take you anywhere! I imagine it’s hard For any author to trust an illustrator with their book. Just how scared were you to put your book in the hands of another artist? I was fortunate to be able to work in partnership with my illustrator, the talented and creative Toronto artist, Sari Richter. This was the fun part of writing! Together we decided what words and pictures would look best on each page. First Sari would show me a pencil sketch. If I liked the idea, she would do a more detailed drawing. We might even decide on a few changes before the final drawing and colours were added. We did this for every page until all 32 pages were done. Then we would choose which illustrations would look best for the front and back covers. What were the challenges you had to encounter to complete High in the Sky? My main challenge was the time it took to get the rhythm and story just right. I didn’t just write it one time and that was it. I would write a bit, let it sit for a while, read it to other people, listen to their suggestions, make lots and lots of changes until finally, I was happy with my story. And in a picture book, the fewer words the better! On your journey to becoming an author, what has been the best and worst advice you have received? The best advice was to read what you want to write. In my case, it was picture books. Even now, I am frequently at my local library borrowing stacks of picture books. Some books I love, others not so much. I study why one picture book works and another doesn’t. And then, just write. Don’t fuss or convince yourself that you can’t or that now is not a good time. Write your first draft by hand – just your thoughts and your notebook that you can do anywhere without electronics to distract you. The worst advice was that writing a picture book is easy. Wrong! It’s a long process of writing, reading out loud and editing because you’ve only got 500-800 words to tell a compelling story. Who are your favourite children’s authors? As a child, I always loved the amusing Amelia Bedelia series by Peggy Parish, about the literal-minded housekeeper who used real sponges in her sponge cake. My favourite picture book is Something from Nothing by Phoebe Gilman, a Jewish folktale about Joseph’s baby blanket being transformed into smaller items until nothing is left but a story. I love the repetitive, rhythmic phrases, charming illustrations and simple yet heartwarming story. What’s the best question you have been asked? What do you like best about being an author? The best thing about being an author is having my books in libraries around the world and knowing that people miles and oceans away are reading my stories. It’s like I’m travelling the world with my books! High in the Sky has been acquired by libraries across Canada, Australia and New Zealand. I also love sharing my books with schools and libraries for Storytime and Craft and Author Visit events. Is there anything else you would like to share with us about yourself, your writing, or High in the Sky? I have seen publishing come a long way! As a stay-at-home mother from 1978 until 1988, I wrote poetry and also articles about talented people in my neighbourhood for a community magazine and a local newspaper column. Back then, I didn’t use photocopiers, email or computers. I used carbon paper, an electric typewriter and drove my articles to the magazine and newspaper offices. 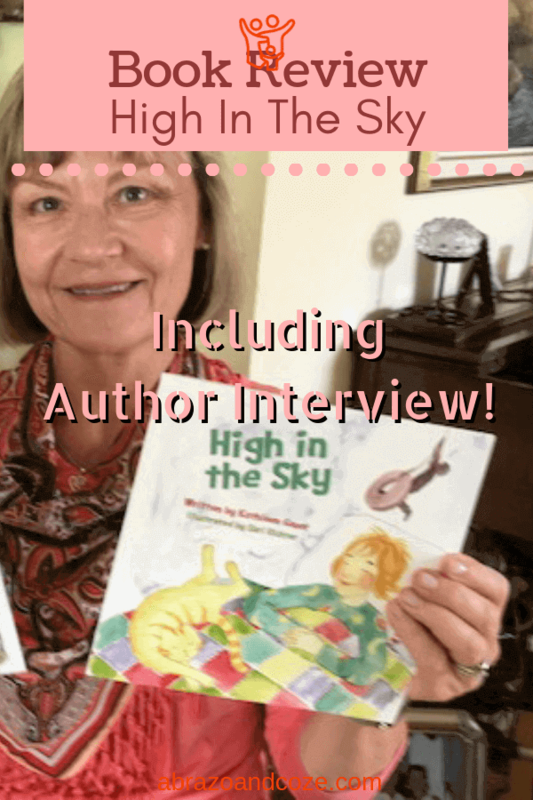 If you’d like more information about High in the Sky, you can visit the author on her Facebook page, or website. She even has a fun colouring page and paper plate tire swing craft that you can do with your children. You can borrow High in the Sky from your local library (if not, definitely request the title). Currently it’s in several libraries across Canada, Australia, and New Zealand. You can buy the book directly from the author’s website, or from Amazon. Do your kids have a swing they love to play on? What do they do for stress relief? Let me know in the comments. If your children don’t yet have a means for stress relief on a regular basis, consider the benefits of meditation, and learn with them how to meditate. If you’re looking for other fun books to read with your children, you might like these: Nonni’s Moon, Cami Kangaroo Has Too Many Sweets, or Cami Kangaroo Has Too Much Stuff.